Are all Cosmopoli'French teachers French native speakers? 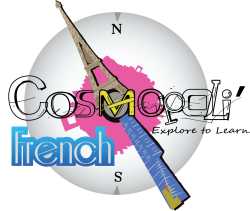 Cosmopoli'French offers small group lessons with a maximum of 8 students to provide the best learning environment. How long does the class go for? Our members attend one class a week (for 9 weeks) and each class goes for 1.5hr. Our level description can give you a good indication of which level would be right for you, and we are always happy to give you personal advice. Can I change level in the middle of the term? You can enrol at anytime. However, we recommend our members to join the course from week 1 in order to get the best results. What is the difference between the All Inclusive Pack and the Essential Pack? The All Inclusive package includes catering for the Say it with Food workshop and tickets for any other extra activities that will take place outside Cosmopoli’French premises. Members who choose the Essential pack will be paying for their meals and drinks at the restaurant on the day of the workshop. Do I need to buy any extra textbook for this course? In order to help our members consolidate their grammar skills, we are using a grammar book - Practice makes Perfect - Complete French Grammar. This book is available at Cosmopoli'French ($25) and you will be able to buy it on your first class. We will be using Practice Makes Perfect throughout all our levels.